It’s easy to underestimate the importance of strong landscaping for your commercial property. The advertising potential of an attractive design and its impact on the client and employee experience is an intangible value that shouldn’t be a casualty in your bottom line. After all, it does not have to be an outrageous expense to provide your office building with strong curb appeal. That’s exactly what Natural Lawn and Landscape helps businesses in St. Louis and St. Charles to accomplish. We can help your commercial property achieve the positive image you’re looking for. Beyond creating a professional atmosphere, our comprehensive landscaping services can help you save on property management costs. You can rely on our expertise to create a wonderful looking property that will attract more clients to your business or Home Owners Association (HOA). A landscape maintenance plan from Natural Lawn and Landscape will help preserve and enhance your property’s value. We serve all commercial properties including HOA’s, apartments and retail. Whether you’re a corporate campus or a traditional office park, the benefits are the same — well-manicured turf, colorful displays and enhanced signage make for a welcoming business environment. We offer a full range of service plans to completely fit your companies or HOA’s needs. We can customize the plan to not only make your property look great but, as mentioned, do it economically. 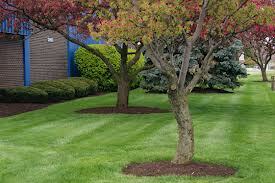 Natural Lawn and Landscape also offers a budget billing program that allows for equal monthly payments. This has proven to help our customers budget more efficiently for the year.